Pakistan Tehreek-e-Insaf (PTI) was founded by Imran Khan. Find Pakistan Tehreek-e-Insaf (PTI) PTI Detail Election Results 2018, national assembly Seats, Sindh, Punjab, Balochistan & Khyber Pakhtunkhwa KPK, FATA, News, Candidate names, Pakistan Tehreek-e-Insaf (PTI) PTI Party Contact Information, Party Flag, Logo & Songs. In 1997, he has started a socio-political movement in Pakistan known as Movement for Justice (Urdu: Tehrik-e-Insaaf) and ran for office in the National Elections. 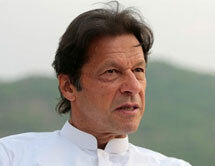 The movement has Islamic overtones and was inspired partly by Khan's renewed commitment to Islam. He became a Member of Parliament for Mianwali in the October 2002 elections. He is very critical of the judicial system in Pakistan, which he says prevents accountability for the elite class in Pakistan. Initially Imram supported 1999's militray coup of General Pervez Musharraf, however came in to the fore-front of those against General and President Musharraf.